Our technicians know how to approach a wide variety of heating systems, and can successfully repair, service, and install any system you need. 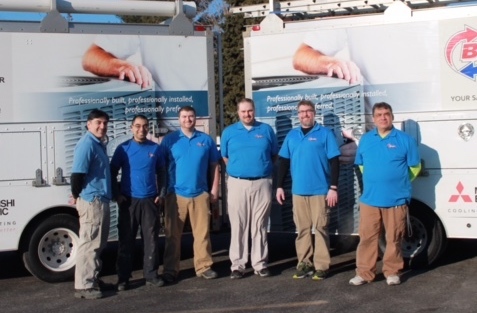 Serving Northwest Indiana, Buck's Heating & Air is dedicated to understanding the heating and cooling industry inside and out. Our hardworking team prides itself on delivering high quality work at an affordable price. The best part of our business is getting to know our customers and gaining their trust. We are proud to be an Armstrong Air Comfort Team Member & a Mitsubishi Diamond Contractor. Armstrong and Mitsubishi heating and cooling systems offer efficient, reliable resources for every type of HVAC system. We sell, install, and maintain everything from traditional gas furnaces to progressive geothermal units and duct-free systems. We strive to be available for customers when they need us most. That's why we offer 24/7 emergency services for customers throughout the Northwest Indiana area. At Buck's Heating & Air, we are always upfront with you about our prices. We truly want you to feel comfortable with every step of the installation, repair, or maintenance. Our technician will explain the details and the price of the job with you before any work is begun. Choose Buck's Heating & Air if you are looking for an HVAC contractor in Northwest Indiana who is dedicated and reliable. Our fully qualified technicians will do what they can to be there for you. We offer high quality work at reasonable rates. Call our Chesterton, IN office today at 219-406-8758 to find out how you can become one of our satisfied clients. At Buck's Heating and Air your satisfaction is our number one goal!